Dips are ideal for busy parents and for kids who like the fun element of eating them, either with raw vegetables or spread over crackers or toasted bread. Plus dips are incredibly easy to prepare and are both nutritious and inexpensive. If you have any left over, they can even be used as sauces for pasta, rice or couscous. Bring a large pot of salted water to the boil, then add the broccoli stem - just cut it into chunks. Cook the broccoli just until it's tender, then drain well and keep a small amount of the cooking water. 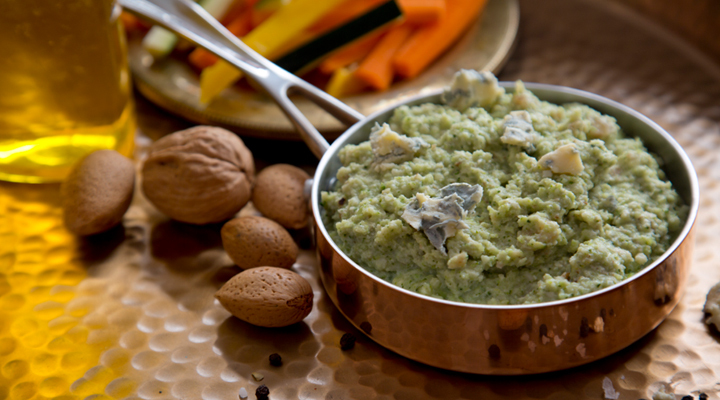 Place the broccoli in a food processor or blender with the gorgonzola, almonds, olive oil and some salt and pepper. Blend together until well combined. If the dip is too thick, add a bit of the reserved cooking water.